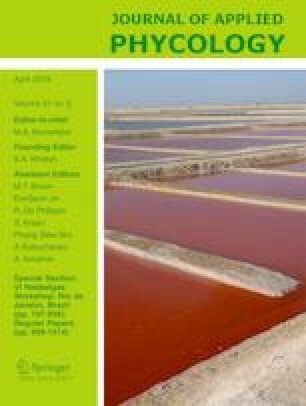 The aim of this study was to evaluate the antioxidant effect of red seaweed Pyropia columbina on juvenile Pacú (Piaractus mesopotamicus). Two hundred and ten (n = 210) fish were fed for 90 days with a control extruded feed (CEF) or the same feed added with P. columbina (35 g kg−1) (PcEF). No significant difference in final body weight, specific growth rate, condition factor, and liver somatic index was detected between dietary treatments (p > 0.05). Fish fed with PcEF showed lower lipid peroxidation (28.2 ± 2.9 vs. 39.4 ± 3.7 mmol malondialdehyde mg−1 protein) and superoxide dismutase (23.3 ± 2.3 vs. 37.7 ± 3.0 U mg−1 protein) and reduced SOD/CAT ratio (5.5 ± 0.3 vs. 8.1 ± 0.7) in intestine than those fed with CEF (p < 0.05). These results also were observed in liver and white muscle, indicating a systemic effect. No difference in glutathione S-transferase and catalase (CAT) activity in intestine, liver, and white muscle was detected between dietary treatments (p > 0.05). PcEF showed higher hemoglobin (7.5 ± 0.4 vs. 6.6 ± 0.3 g 100 mL−1) and mean corpuscular hemoglobin concentration (18.4 ± 1.8 vs. 25.7 ± 2.7%) than those fed with CEF diet (p < 0.05). Beneficial effects on lipid metabolism were observed in fish fed with PcEF respect to control diet. Pyropia columbina could be used as a natural antioxidant ingredient in fish feeding contributing a better nutritional status of cultured fish. This work was funded by the projects PICT-2013-1804 and CAI + D 2011 PI 0292 LI from ANPCyT and Universidad Nacional del Litoral, respectively.